before he joined the U.S. Army. In P.R., he obtained an associate’s degree in criminal justice and was a member of the P.R. SWAT team. But Jorge wanted a bigger challenge in life. So he joined the U.S. Army in 2001 just in time for 9/11. Jorge was sent to Afghanistan with the 82nd in 2002, among the first U.S. detachments to enter the country seeking out the Taliban that had been involved in 9/11. “I was there eight months in that first tour of duty,” he said. “The 82nd was based in Kandahar. We did not do any jumping, there was no need for that, but we were in many firefights.”Like many soldiers from the U.S., Jorge has vivid memories of what he found in Afghanistan. “The country was really shocking,” he said. “It is terrible country, no electricity, no water, no sewage. People live in tents. It gets really hot, up to 120 degrees, and there is no air conditioning, at least not where we were. “To go from a civilized place to a place with only sand and mountains and no technology at all was really shocking. I was there from April to October 2002 on that first tour. We were engaged in several fights with the Taliban, but we did not lose people. It was just when the invasion was getting started. We did have some injuries, but no one died. “In Korea I came up for reenlistment, Jorge said. “They would send me anywhere I wanted to go. So I requested Hawaii, which was familiar. I was posted there in March 2004. My wife Enid came to join me with our daughter Amanda and son Jorge. I loved Hawaii. Of course, being from Puerto Rico, I am an islander anyway. But we weren’t there very long. My unit was deployed to Afghanistan almost immediately. I was only in Hawaii three or four weeks. “I was attached to the Special Forces in Afghanistan,” Jorge said. “We were looking for Osama Bin Laden. We were doing patrols searching for caches of weapons. I was leader of a team of four. We went with different teams, a total of 16 plus medics and translators, traveling in six vehicles. I saw these people in the middle of the desert doing a burial. That seemed weird to me. So I made the turn off the road, and immediately my vehicle blew up. They had planted those mines 10 minutes before we got there. “I was driving the Humvee for our lieutenant,” Jorge said. “We were the first patrol. At the end of the week we were to pass the route to another team, I was showing the new lieutenant around. I was driving, and the left front of the vehicle went across the mine. I was the only one hurt. No one died. The translator got his leg broken, but did not lose it. I freaked out, I was crying, I was afraid, I was thinking about my family. I could not believe that happened to me. But my buddies were there. Once they gave me morphine, I was okay. “A firefight ensued, but I was not part of it. My right leg was basically blown off just below the knee. From what I heard, my guys killed the insurgents. I got treated on the spot and then was taken to the hospital at the Bagram Airfield, one of the biggest U.S. installations in Afghanistan. I spent the first night in the hospital there and when I woke up, I was in Germany. I spent six days in a hallway in Germany because it was too crowded. Then I was sent to Walter Reed in Bethesda, Maryland. “The original injury was below the knee, but because of those six days I spent waiting in the hall in Germany, my leg got infected. They said they had to cut it off above the knee in order to save the leg. I said, ‘Go ahead and cut. 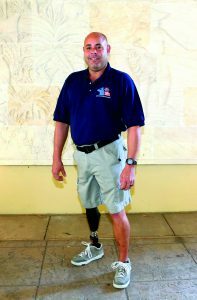 Do what you have to do.’ “I was to be in there for seven months,” Jorge said. “Enid came with the children. So we set up a second household at Walter Reed. They provided for us. But in Hawaii we had all been warm with summer clothing. We had to buy a lot of winter clothing, a complete change. But we still had regular debts back in Hawaii. I was taking on a lot of debt just to make ends meet. That’s when the Coalition to Salute America’s Heroes showed up. I told them about the financial pressure and for six months they paid my bills. They took care of me and my family. When I got home I had enough money to get along. It really made a big difference for us. “The Army posted me back to Hawaii. Perhaps because I was one of the first from Hawaii to be injured in the war, I had a lot of freedom. The sergeant said, ‘If you don’t feel like coming to work, stay home.’ So I had three easy years in Hawaii. I have five kids, two from an earlier marriage. They all live with me now. On the other hand, Jorge is now on the cutting edge of prosthetic technology. The wizards at BAMC use Jorge to test the latest developments in synthetic legs. He was among the first to receive a computer operated leg, and now sports the latest model, the X3, that is waterproof. “I am their lab rat,” he said cheerfully. “But I don’t sleep with it. It runs on batteries, and I have to recharge it every night.